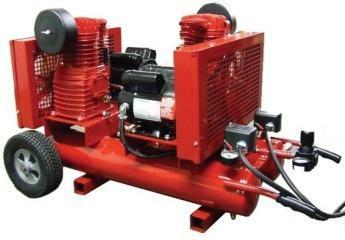 The Fireball® air compressor is designed for residential and light commercial air duct cleaning. The Fireball® uses 110 volts to operate allowing it to be used in places where a gasoline powered compressor cannot. Fast recovery to help you keep moving on the job. Wheelbarrow style with 2 Flat-Free tires for ease of movement. 3 different modes let you choose the most effective way to operate. Low maintenance for years of service. Quiet operation allows you to work with minimal disturbance. Using on site power you can run all day long without stopping to refuel. NO GAS TO BUY!!! This unit can pay for itself in fuel savings alone!! !